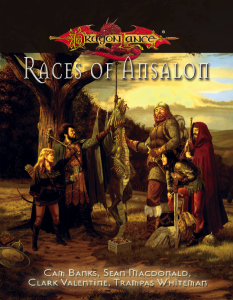 This is a D&D 4e conversion playtest document for Races of Ansalon, a D&D 3.5 sourcebook published by Margaret Weis Productions. The document has been posted here for playtesting purposes and, should you decide to use this in your D&D 4e game, we would very much like any feedback and questions you may have on the Dragonlance Nexus Forums. I’ve never had my guts ripped out before and, while it would certainly be entertaining, I don’t suppose it would be conductive to a long life. Tanis is always telling me to think before I do anything, whether or not it is conductive to a long life, and not to do it if it wasn’t. I’d say that comes under the last category.